Sync Modular Synths and Electric Instruments with Raspberry Pi @Raspberry_Pi #PiDay #RaspberryPi « Adafruit Industries – Makers, hackers, artists, designers and engineers! The Raspberry Pi community is wonderfully collaborative, with people all over the world supporting each other to make things they care about. It’s part of a much wider maker movement, and a new project from seismic industries, called spink0, brings the power of Raspberry Pi to another DIY community in the music world: modular synthesizer enthusiasts. Modular synthesizers are dedicated machines for creating and controlling electrically generated sounds. Unlike the ubiquitous electronic keyboards, they don’t offer pre-set sounds. Instead, they allow players to deeply manipulate the nature of sounds: by connecting different modules with each other via cables, players use signals from one module to affect and alter the sounds from another, and generally get very creative with not just the musical notes but the sound itself. Recent developments in technology, and enterprising module creators, have made these machines much more accessible, largely through a modular synth format called eurorack. 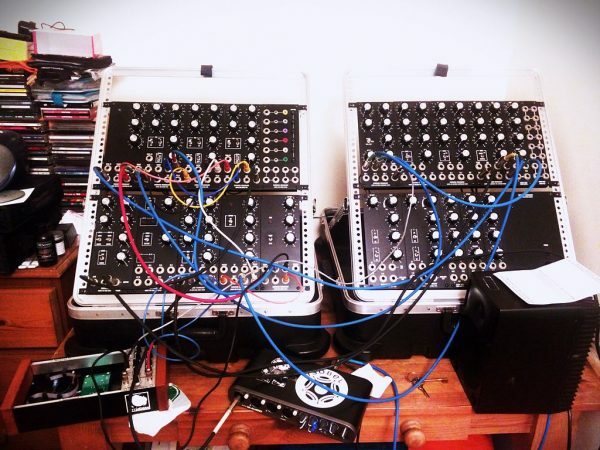 A thriving DIY community has also grown, with people assembling their own modular synths using kits or even building their own modules from scratch. Enter the Raspberry Pi Zero W, just the right size for adding sophisticated computing power to a eurorack module. The spink0 eurorack module uses the power of a Zero W to allow musicians to keep their eurorack synth music in time with music created with more common electronic instruments like drum machines and computers. The Zero W connects to a wireless network and uses the Ableton Link protocol to share timing information across this network. It converts this digital data into the analogue square wave clock pulses that modular synths use for musical timing.